Allure Beauty Box Reviews: Ideal Subscription for You? Allure Beauty Box promises to deliver five “deluxe-size” samples of brand-name beauty products to you each month, just for $15 per box. Allure Beauty Box Review: Ideal Subscription Service for You? For those looking to expand their collection of cosmetic products, Allure Beauty Box provides subscribers with five editor-curated products that the company states have a combined retail value between $50 and $90. The products within each box are promised to be at least “deluxe size,” which the company defines as a sample with three uses minimum. Also included are high-value, single-use products like facial masks. To keep things interesting and add extra value, the company claims that they frequently add bonus items to each subscription box. 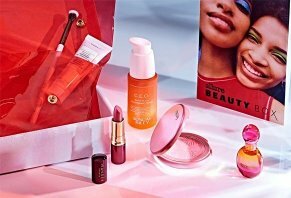 Along with this curated collection of products, each Allure Beauty Box edition also includes a mini magazine with tips for using each product. The promise of discounted beauty products is tempting for millions, which is why beauty boxes have surged in popularity in recent years. Does the Allure Beauty Box hold its own, or are there better options available for expanding your cosmetic collection? Let’s look at the details. How Does Allure Beauty Box Work? As previously stated, the Allure Beauty Box delivers a curated collection of beauty products to your doorstep on a monthly basis for as long as your subscription permits. Active subscribers will typically receive their box by the third week of the month, and new subscribers can expect theirs within 20 days of signing up (these timelines are subject to change during popular months). Allure’s editorial team selects the products within each monthly box, and they strive to choose ones that work for a variety of skin types and complexions. They acknowledge that certain products will be a better fit for some people than others, but that part of the fun of a subscription kit is gaining the opportunity to experiment with products you might not purchase otherwise. That being said, subscribers have a few options to source products that are a better fit for them. Upon sign up, the Allure website lets you specify a few general beauty preferences, like your skin color for foundation shades. And if a product isn’t to your liking, the company suggests sharing it with a friend or swapping it for something more suitable on an online forum. While Allure strives to keep it a secret what’s within each month’s box until they are shipped out, you can follow their social media channels (Facebook, Instagram, and Twitter) for sneak peeks of the products they will contain. If you receive an Allure Beauty Box with four items or less, the company suggests you contact their customer care team at BeautyBox@Allure.com or 1-800-274-1603. Also included in each order is a “mini magazine” with product information and instructions for using them. What Does Allure Beauty Box Cost? At the time of writing, Allure Beauty Box offered several payment options. Subscribers can pay $15 monthly and save $5 off their first month. Alternatively, you can pay $150 for a full year’s subscription and save $30 off the monthly rate. Each order also includes free shipping. For those who don’t want to commit to a full year, you can also select a three month ($45) or six-month subscription ($85). These shorter subscriptions are advertised as great gift ideas, and the original purchaser receives a bonus gift valued at $15 or more. According to Allure’s FAQ page, you will be billed each month for a new Allure Beauty box for as long as you stay subscribed. To clarify, signing up for a set subscription timeframe (like six months) doesn’t mean that you will stop receiving the boxes after that time expires. Instead, it means that you are charged one lump sum for the boxes and will be charged that same amount again for the next billing cycle unless you cancel ahead of time. You can cancel your membership at any time by emailing their customer support team at BeautyBox@Allure.com or 1-800-274-1603. However, you won’t be refunded for any upcoming months that you have already paid for. What Can We Learn from Allure Beauty Box Reviews? The best way to learn more about the differences between beauty box brands is to gauge the response of customers that have used them. What do Allure Beauty Box reviews tell us about this subscription service? Let’s look at the details. Influenster had over 3,000 reviews of Allure Beauty Box at the time of writing, and the boxes averaged 4.23 out of 5 stars. We noticed that dozens of reviewers appreciated the “mini magazine” that came in every box, and most found that the value of the products inside far exceeded the amount that they paid. Others noted that they appreciated the opportunity to try out products before committing to full-size versions, though some thought that the sample sizes were too small to give them enough of a sense of each product. We also noted numerous complaints about Allure’s customer service that claimed it was slow and unresponsive. Many reviewers mentioned that their boxes came late, not at all, or after they thought they had canceled their subscription. This fit our experience with Allure’s customer service, as we reached out to the company numerous times with questions and never received more than an automated response. Overall though, Influenester reviewers who received their Allure Beauty Boxes as expected seemed pleased with their overall selection and range of brands it contained. Amazon also sells the Allure Beauty Box (fulfilled through Allure), and the company had almost 500 reviews at the time of writing. Some of the reviewers compared the beauty box favorably to BirchBox, saying that Allure gave them larger sample sizes and allowed for more customization options. Reviewers on Amazon also noted that each box seemed like a good value for the money and that it helped them find new favorite products to try. Most of the negative reviews on the site again dealt with customer service complaints. How does Allure stack up against their beauty box competition? This chart compares some relevant statistics. This chart makes it clear that Allure Beauty Boxes are moderately priced at $15 compared to the competition, which ranges from $10 to $21 per box. You’ll receive between 5 - 7 items each month, and the company states that the expected value is between $50 - 90. This means every dollar spent on Allure Beauty Boxes is worth between $3 and $6, a pretty decent return on investment. Birchbox, in contrast, offers only $2.5 - $4 in value per dollar spent. Allure boxes tend to skew towards sample size products, and we noticed some reviews stating that these products were too small to get a sense of whether customers would want to buy it full-sized. And, while Allure lets you specify basic details like your skin color for foundations preferences, they ask for significantly less detail than Ipsy, Glossybox and Birchbox do through beauty profiles and online quizzes. Generally speaking, Allure Beauty Box doesn’t stand out in any significant way from the competition we looked at. It’s a well-priced option in the middle of the pack that offers good (but not exceptional) value. Whether you love the products inside more than other beauty box brands will most likely come down what’s delivered on the months you receive it. Our View: Should You Consider Allure Beauty Box Over Other Brands? From our research, Allure offers a solid middle-of-the-road beauty box for makeup enthusiasts. You won’t receive exclusively full-sized products like Boxycharm, but you’ll also pay only $15 per box. While the reviews we read about Allure Beauty Box were divided about the value of each box’s “deluxe sized” products, many reviewers noted that they appreciated the opportunity to experiment with different products without committing to anything full-sized you might not use. It’s important to note that Allure doesn’t give you as many options to customize the content in your box as other subscription boxes strive to do. This might be good for people who are open to experimenting or aren’t sure what products work best for them, but it might be a drawback for those with specific preferences. As most of the complaints about this subscription seem to be related to customer service, we recommend noting when you need to cancel your subscription to prevent getting billed for the following month. If you’re new to subscription beauty boxes and want a brand to start with, the Allure Beauty Box might be a smart place to start. You’ll get the opportunity to try at least five new products per month for a cost of $3 each. That’s not a bad price to take a bit of a beauty risk. Write a Review for Allure Beauty Box!